Certain occasions require an extra helping of glitz and glamor. Whether you’re celebrating at a party or going somewhere fancy, cocktail rings will jazz up your look. Throw on a gown and a coordinating cocktail ring for the evening- or wear one any old day just to feel extra special! These fancy rings are created for all the fancy events on your calendar. You don’t really need an excuse to wear your favorite cocktail ring, but it doesn’t hurt! Designed to command attention, cocktail rings are larger and more eye catching than regular luxury rings. They often feature a majestic gemstone along with other colorful stones. Often, the metalwork is intricate and there’s no shortage of sparkle. Cocktail ring are made from precious stones such as diamonds, emeralds, and sapphires set into platinum or yellow gold. However, there are less expensive cocktail rings made with semi- precious stones like opal, quartz, blue topaz, citrine, and tourmaline. Cocktail rings came into existence in the 1920’s, during the Art Deco Era where alcohol was illegal. 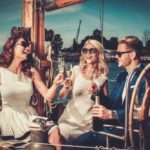 During this time, there were many illegal-held drinking parties calling for decked out fashions. Womens fashion was elaborate, and fancy cocktail rings were all the rage. The name “cocktail rings” was a nod to the forbidden drinks that were sneakily served at these parties. Post-prohibition era, cocktail rings are no longer limited to cocktail parties, but they are still just as popular at galas and special events. These elaborate rings are the perfect addition to an fancy outfit fit for special dinners, work parties, banquets, awards shows, weddings, and engagement parties. A small clutch and some make up will complete your look. Still, you don’t need a fancy event to justify wearing beautiful cocktail rings. They’re well suited for semi-formal events such as date nights and casual gatherings. Put on a cocktail ring any day to make yourself feel extra special. Your specially chosen cocktail rings will say something about you as a person. In most cases, cocktail rings are chosen based on age, taste, event, season, or holiday. Older women may go for the vintage-style cocktail rings. These are available in a wide assortment of styles that feature dramatic swirls and starbursts with glittering gemstones. Some of the most common gemstones include emeralds and mine cut diamonds. 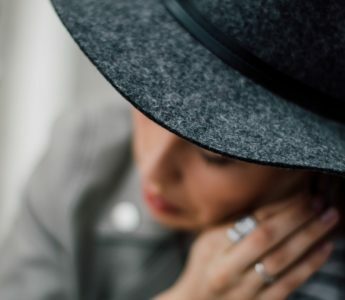 Younger women may also love vintage styles, but lean towards contemporary cocktail rings, which make use of more colors, a wider variety of stones, and more unorthodox designs and shapes. A woman’s taste greatly influences her choice of cocktail rings. 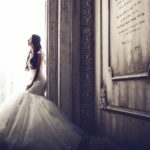 A wealthy woman with expensive taste will go for the rings with more expensive stones like diamonds, sapphire, and emeralds; while women shopping on a smaller budget might opt for semi- precious stones. Cocktail rings are available in patterns that depict cupids, lips, animals, insects, flowers, swirls, and starbursts. There is plenty of room for a creative display. It is also possible to choose your cocktail rings according to the event or holiday. A Retro Art Deco style is perfect for a New Year’s Eve or New Year’s Party. While a more festive colorful ring probably featuring red and green gemstones will fit with the Christmas season. Other holidays such as Independence Day, Valentine’s Day, Easter, and others may feature specific colors or shapes to mark the occasion. From the Old World collection, this work of art is created from blackened sterling silver and 18k yellow gold. It features a large pear-shaped kyanite decorated with white and black diamonds, black sapphires and blue-green tourmaline. From the Emerald City Collection, this breathtaking masterpiece is crafted from 18k yellow gold. 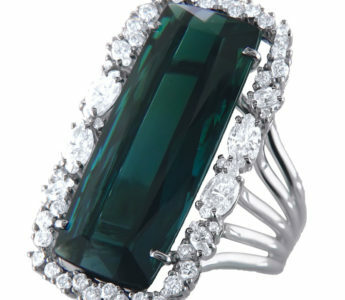 It features a Cushion Cut emerald set in a pointed pave diamond frame. How stunning! This divine beauty taken from the Patras Collection is crafted from 18k white gold. It features an enormous aquamarine gemstone surrounded by dazzling diamonds and a pave diamond band. Cushion Cut Garnet by Madison L.
This Madison L. creation is designed from 14k white gold. It showcases a Cushion Cut red garnet encircled by glittering diamonds. This unique piece is fashioned from 18k rose gold. It is a Mandala elongated ring decorated with amethyst, blue topaz, iolite & rhodolite gemstones. An unusual shape for a unique woman. This Mikimoto beauty is designed with 18k white gold. It features a majestic 16mm Black South Sea cultured pearl with diamond pavé set. The settings gorgeous prongs curve around the pearl. From the Couture Collection, this exquisite piece is made from 18k white gold. 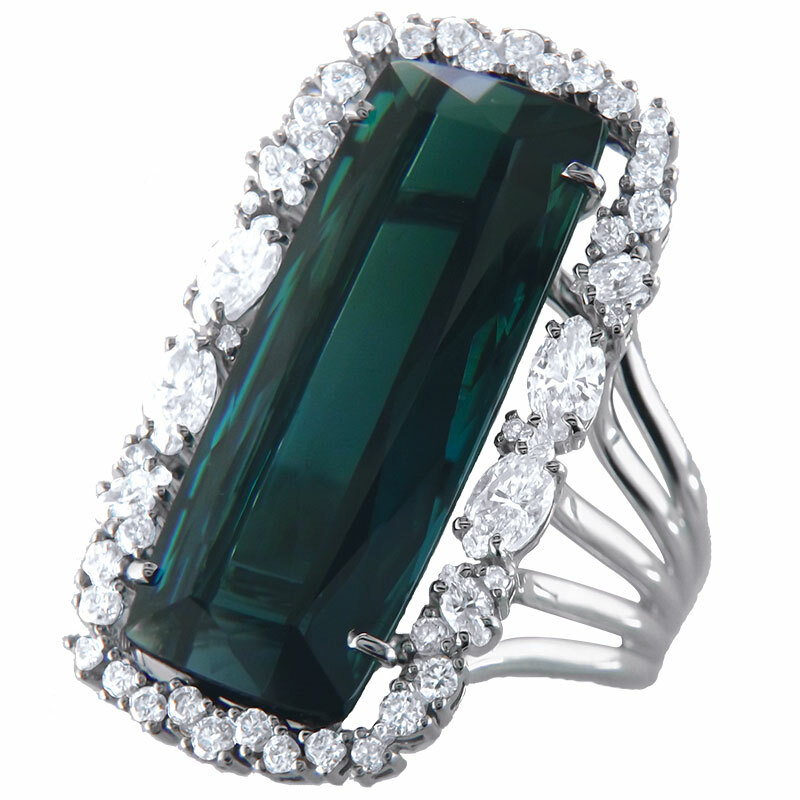 It features a deep green Tourmaline center stone set in a frame of brilliant cut diamonds. There is no other type of ring that will give you the wow factor like cocktail rings do. With many shapes, styles and colors to choose from, a fancy cocktail ring as a must-have for your armoire!